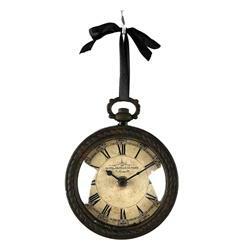 Evoke a sense of the old world with this incredibly eye-catching pocket watch style wall clock. Made of antiqued iron with a rusty finish, this clock flaunts ornate iron detailing on the back, making it a great hanging clock on the wall or off. The glass-enclosed face of this clock features Roman numerals, an aged look and appropriately-styled clock hands, adding to the overall design. Accompanied by a black ribbon for hanging, this battery-operated clock will keep today's time in the rustic or French-inspired interior.